Blackpool Rail Grinder 752 was acquired by the MTMS in 2008. 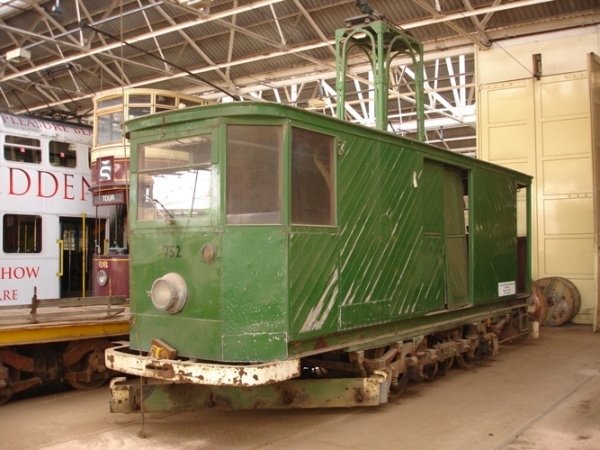 This surplus tram was offered to the Society in August 2008 when Blackpool Transport began their fleet reduction in preparation for the 2012 upgrade. 2012 will see new tramcars operating on the promenade and many of the existing fleet will be available for museums to acquire. 752 is to become a dedicated works car at Heaton Park. This will mean that 765 and 96 will no longer be drafted into use as such as demand required. 752 is currently receiving some attention to bring it back into usable condition. It will ultimately be repainted back into its original red livery, receiving its original fleet number ‘1’. In March 2010, 752 became our first illuminated tram to mark the 30th Anniversary of the tramway. 752 played a significant part in extending the Tramway in 2011. Due to depot space shortage, it was store off site for a while, returning on 23rd July 2013.